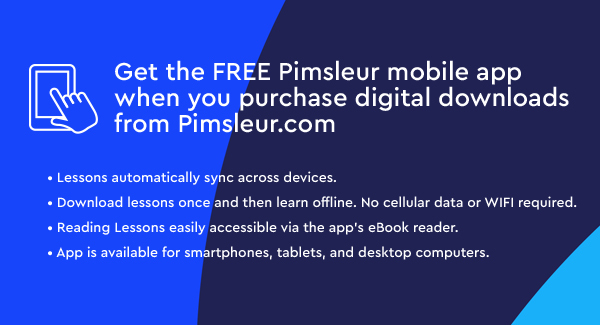 Pimsleur includes 5, 30-minute audio lessons, reading lessons, and culture notes as streaming or audio download, plus an integrated Reading Booklet and Culture Notes Booklet. 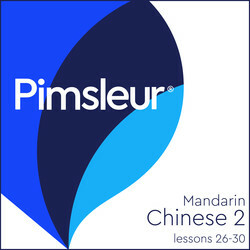 This course includes Lessons 26-30, plus reading instruction and culture notes from Pimsleur’s Mandarin Chinese Level 2 program featuring 4.5 hours of language instruction. Each lesson provides 30 minutes of spoken language practice, with an introductory conversation, and new vocabulary and structures. 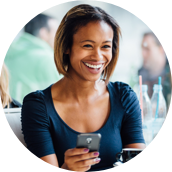 Detailed instructions enable you to understand and participate in the conversation. Practice for vocabulary introduced in previous lessons is included in each lesson. The emphasis is on pronunciation and comprehension, and on learning to speak Mandarin Chinese. In Level 2, you'll continue to practice reading Hanyu Pinyin (pinyin for short) the official phonetic system for transcribing pronunciations of Chinese characters into a Latin alphabet. Reading lessons are included and will build upon the pinyin reading skills acquired in Level 1. These lessons are designed to give you practice reading and to provide new vocabulary. Over one hour of recorded Culture Notes is included after the Reading Lessons. These Notes are designed to provide you with more insight into Chinese language and culture. A Culture Notes Booklet is included with your download.